Clutch is a mechanical device that is used for engagement and disengagement of transmission from the driving shaft to the driven shaft. The primary function of the clutch is to transmit the torque from the engine side to the drivetrain. The clutch operates quietly and mitigates the drive-related vibration during its operation. Several friction materials are utilized to manufacture a clutch in order to ensure smooth engagement of gears, offer resistance, and providing strength. Organic friction materials are commonly used as friction material for clutch facing, as they offer a perfect combination of smooth engagement, wear resistance, and cost-effectiveness, as compared to others friction materials. Dual clutch transmission and automated manual transmission are gaining popularity among car manufacturers as these systems offer all the convenience of the conventional automatic transmission, but at a lower price and without hampering fuel efficiency. These factors are likely to drive the demand for automotive clutch considerably during the forecast period. Increase in demand for SUVs, crossovers, compact SUVs, and premium cars across the globe, especially in countries in Asia is a primary factor that is estimated to drive the clutch market during the forecast period. Increase in industrialization, which is boosting the logistics industry, expansion of the IT industry, especially in metropolitan areas, increased population, and migration toward urban areas for better job opportunities, thereby augmenting daily commutation are all driving the production of commercial vehicles. Heavy commercial vehicles have been witnessing the adoption of automatic transmission owing to several advantages such as fuel economy and easier driving training for drivers. These factors are likely to boost the overall market during the forecast period. Increased disposable income and spending capacity of the public, primarily in developing countries, on account of significant revenue opportunities, have propelled the demand for vehicles that are forming the critical necessity for commutation. 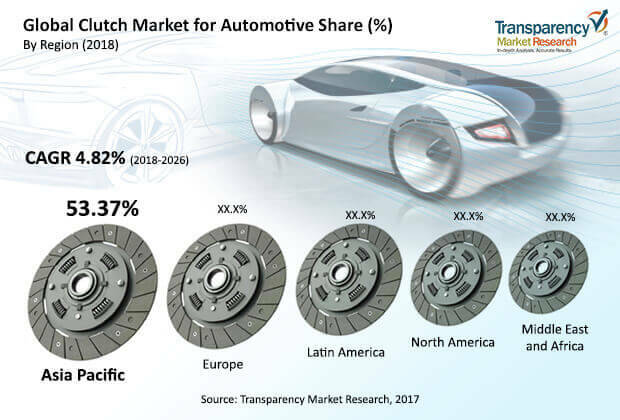 However, increase in automatic transmission vehicles and electric vehicles are likely to hamper the clutch market for automotive during the forecast period. The global clutch market for automotive is expected to expand at a CAGR of about 5% between 2018 and 2026. Dry clutch type segment dominates the automotive clutch market presently, and it is expected to remain the same during the forecast period. Dry clutch is the most used type of clutch in all vehicles due to its advantages over wet clutch such as high coefficient of friction, reduction in transmission power losses and ability to handle more power than the wet clutch. The clutch market can be split into manual transmission and automatic transmission segments. Expect North America penetration of manual transmission is largely present across the globe which is expected to drive the market of automotive clutch during forecast period. Growing dual clutch transmission and automated manual transmission owing its advantages such as competitive cost as compared to automatic transmission, higher fuel efficiency, and better driving experience are likely to boost the segment during forecast period. Rise in popularity of adventurous activities among the youth population has fueled the preference toward compact SUVs and vehicles with off-roading capabilities. This, in turn, has propelled the demand for clutch integration, thereby driving the market. Demand for SUVs and premium car vehicles is anticipated to drive the clutch market during the forecast period. The dry clutch segment held a major share of the clutch market for automotive in 2017. Most vehicles are equipped with the dry clutch system, as it is inexpensive and provides better engagement on good condition roads. However, the dry clutch system has limitations such as it wears out faster than wet clutches and tends to generate considerable noise sometimes. The wet clutch is immersed in oil and hence, it offers smooth clutch engagement. The wet clutch is also utilized for higher torque application. Ceramic material also used for clutch facing and it consists of copper, iron, tin bronze, and graphite. Ceramic materials can withstand considerable heat and hence, they are employed in continuous repeated engagement and disengagement applications. Ceramic clutches wear more rapidly than organic clutches, as they absorb more heat than organic material.